Most baked chicken leg recipes are complicated, this yummy dish uses just a bit of garlic and seasoning before being brushed with olive oil and baked. 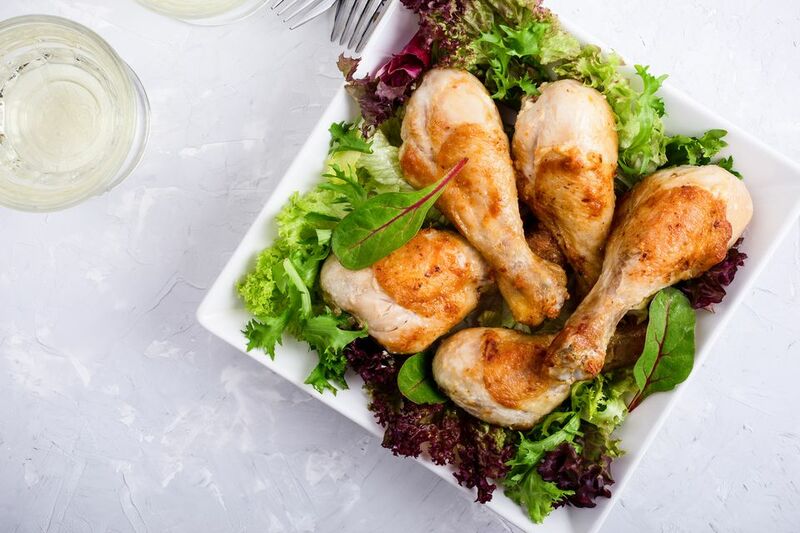 Not only are chicken legs a more economical option than chicken breasts, but they are more flavorful because of the higher fat content. Also, they are almost impossible to mess up — unlike chicken breasts. The legs can stand up to long cooking times, even in the crockpot, making them even juicier and more tender than they already are. For this particular recipe, look for chicken leg quarters on the bone and with the skin on for maximum flavor. If you choose to make this recipe in the crockpot, be sure to follow the cooking instructions on your crockpot for length of cooking time. I love this chicken leg recipe in the crockpot as it fills the house with an incredible aroma. Season chicken leg quarters with salt, pepper and garlic powder in an oven-safe dish with sides that are between 2 to 4 inches tall and big enough to fit all the thighs with a little room around each piece. Make sure chicken legs are placed skin side up and brush with olive oil. Bake chicken legs 35 to 45 minutes until skin is browned and juices run clear when chicken legs are pierced with a fork. Spoon pan juices over the chicken leg quarters and transfer to plates. Serve immediately. This recipe is wonderful with a side of fresh cut fries, roasted veggies or Hasselback potatoes.